Appearance: At least five different species of vulture lived in ancient Egypt. The particular species shown in the hieroglyph was the griffon vulture (Gyps fulvus). Meaning: The vulture was typically associated with the goddess Nekhebet who was the patroness of the city of El-Kab in Upper Egypt. 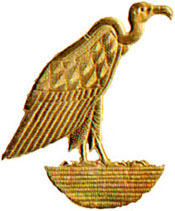 When El-Kab became important early in ancient Egyptian history, the vulture soon became a heraldic creature for all of Upper Egypt. As such, the vulture was often shown with the cobra (the herald of Lower Egypt) wearing the white crown of Upper Egypt. She also appeared in the nebty or "Two Ladies" name of the pharaoh. The vulture was also a symbol of the goddess Mut, as well as Isis and Hathor. The bird also served as a symbol of the feminine, often in opposition to the scarab who signified the male principle.